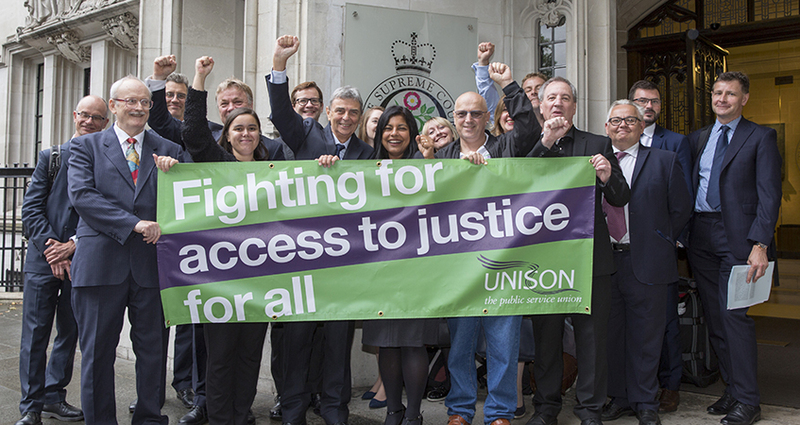 The Government has been forced to scrap employment tribunal fees following a landmark legal victory for Unison. The fees, introduced by the coalition Government in 2013, meant that workers who had been treated unfairly or illegally were forced to pay up to £1,200 to take their employers to court. Unison took the case to the Supreme Court, with lawyers arguing that the fees had been a huge expense for many low-paid employees and prevented people from gaining justice in the workplace – as evidenced by the 79% drop in cases being brought forward after the fees were introduced. The UK’s highest court ruled in favour of the union, stating that the fees were “inconsistent with access to justice” and in conflicted with the Equality Act 2010 because they disproportionately affected women. As a result of the victory, the Government is set to refund more than £27m to claimants in what Unison General Secretary Dave Prentis has described as “a major victory for employees everywhere”. Commenting on the ruling, FDA General Secretary Dave Penman said: “I’d like to congratulate Unison for leading on this issue and ultimately winning this important victory for workers across the country. “When the fees were introduced, the FDA took the decision to pay all tribunal costs on behalf of members, but not everybody has access to this kind of support.